Following on from Mark Chance’s read through review of The Cthulhu Hack, he has now posted up four new Horrors For The Cthulhu Hack – the Chthonian, Dark Young of Shub-Niggurath, Dimensional Shambler, and Fire Vampire. I like the use of Improvised damage as the reduced harm to the essentially immaterial Fire Vampires from gear that smothers. Nice use of the available mechanics. I also posted a brief overview of my first session of The Derelict, Chaosium’s special release for Free RPG Day, that you can now pick up as a physical book through Lulu. 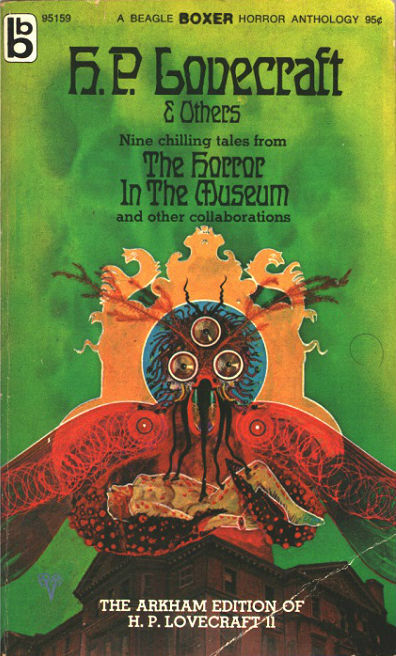 Finally, I liked the use of old book covers in Mark’s horrors article – so, I recommend digging through a few old pulpy covers when coming up with ideas or imagery for your sessions. While some of the covers don’t exactly inspire, the more psychedelic efforts are great.